HAWI, Hawaii » Those blinking warnings lights on wind energy machines at the northern tip of the Big Island have residents blinking mad. About 100 people have signed a petition seeking to turn the lights off on 16 towers with three spinning blades reaching a height of 199 feet. Flashing randomly, the lights irritate residents, are causing headaches and in one case pose the medical danger of a condition called photic epilepsy, said opposition leader Richard Liebmann. The problem is that the 16 towers stand about 500 feet from Upolu Airport. It is not much of an airport, with no staff and only seven recorded landings last year, according to retired Air National Guard Col. Steven Groves. But the Federal Aviation Administration told Robert Treiberg, chief executive of wind machine owner Hawi Renewable Development LLC, that he "should" have the lights -- meaning he would not get clearance for his $16 million, 10.6-megawatt project without them, Treiberg said. 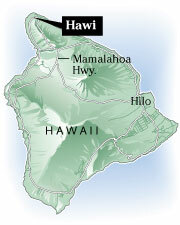 Liebmann bought his land with a view across the sea to Maui in 2000 and built his house three years ago. The wind machines were completed in February. Liebmann's proposed solutions include a radar system, approved in Norway, that turns lights on at a remote airport when a plane approaches. Treiberg responds that the system is not approved in the United States. Liebmann also suggests a system where a pilot can "squawk" the lights, turning them on from a plane, the same as with runway lights. That is no good for a low, night-flying helicopter that does not intend to land, Treiberg says. Perhaps the helicopter should not be there, but Treiberg cannot take the chance. At least reduce the number of lights, Liebmann said. This one Treiberg can do. Apparently there have been complaints about lights on wind machines across the country. Since Treiberg got his permit, the Federal Aviation Administration has changed its rules. At Hawi that means six lights are now enough, and they can be synchronized instead of the more irritating random flashing. Liebmann, Treiberg and others will meet Tuesday to discuss the possibility.